There will always be imitators and fakers, but Inertia has the largest parties on South Padre Island. Spring Break Party Packages EXCLUSIVELY sells a Spring Break Wristband for Inertia Tours events. 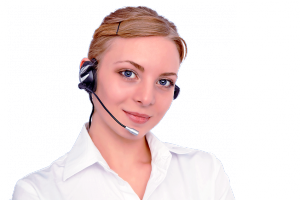 Inertia Tours brings down 5 TIMES more students than all other student travel agencies COMBINED. We have far too many travelers to use just one hotel – we use 4 beachfront hotels, and completely take over 5 other full beachfront condo complexes on South Padre Island during Spring Break. Our spring break party package program runs from February 24th to April 1st. If you still need to buy a spring break trip, we have 4 nights/5 day deals for just $299 per person in a beachfront hotel like the Pearl and Hilton, 2 dine out meals per day per person, which INCLUDES Red Carpet VIP Party Package wristband with all our night time parties, the party yacht cruise, plus VIP status at Clayton’s Beach Bar for the #1 spring break beach stage in the WORLD! Book online at www.inertiatoursspringbreak.com. If you already have accommodations NOT with Inertia Tours, buy your wristband today for only $65 per person. BUY WRISTBANDS HERE. Here is our partial line up for our night time parties – ALL of these concerts are INCLUDED at no extra charge in our Red Carpet VIP Party Package wristband which you can purchase HERE. BUY YOUR 2019 SPRING BREAK WRISTBAND TODAY! 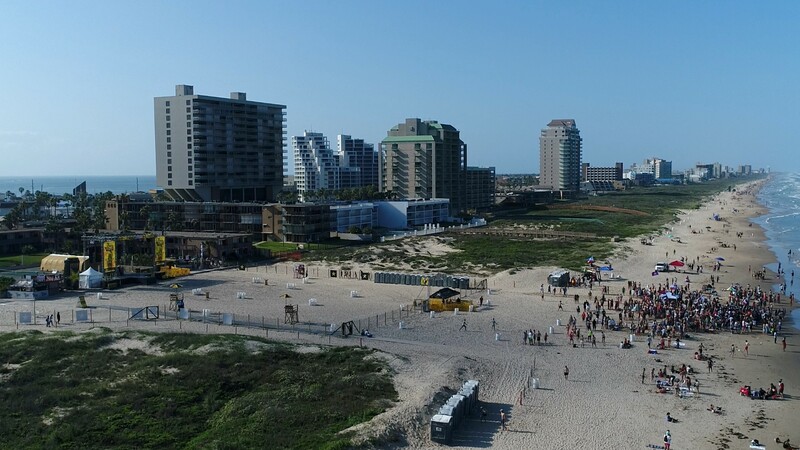 The Spring Break Beach Stage at Clayton’s Beach Bar is not just the largest on South Padre, it is the largest in the world. Our Spring Break Wristbands for 4 nights or more with the booze cruise AND VIP Status during the day at Clayton’s are available at here starting at $65 per person. 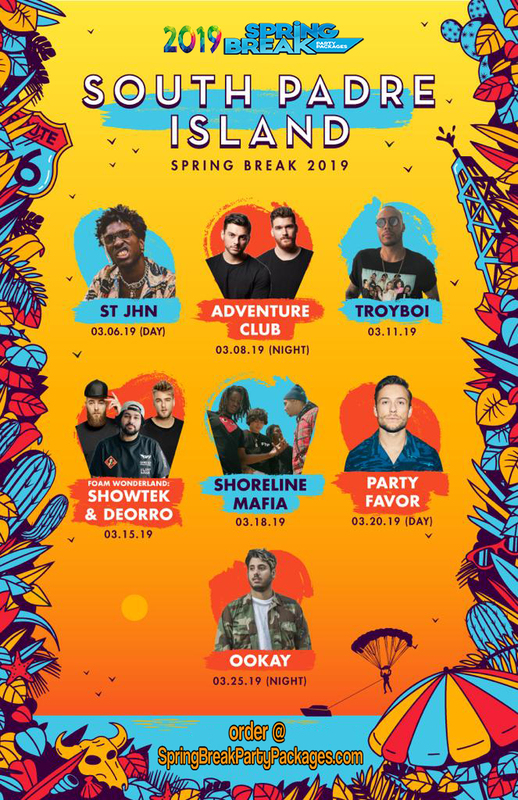 You must order them in advance, and then you pick up your wristbands and booze cruise boarding passes at our office at 2600 Padre Blvd, South Padre Island, TX 78597. 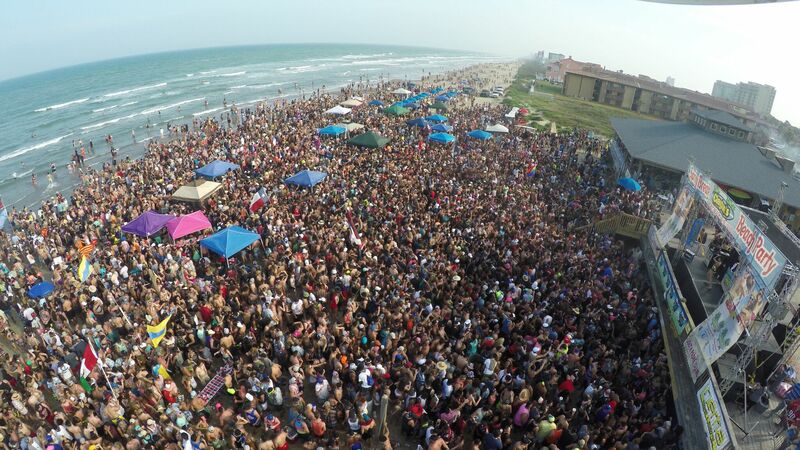 In case you wondered, YES there are of course other spring break stages on South Padre. We took a photo, untouched of BOTH our stage at Clayton’s Beach Bar on March 18 of 2017 & the other stage on the same day. These photos are not doctored, we don’t use photoshop like our competitors to try to make it look busy, nor take photos from like 1 inch off the stage so all you can see are the tops of 200 people’s heads. We take DRONE shots from 100 feet up to show the 30,000 person deep crowd’s Inertia draws at Clayton’s. The comparison photo in all fairness was taken around noon, NOT at peak times for Clayton’s. Competition’s dead beach stage on south padre island that is not Clayton’s. This photo was taken on March 18th of 2018. Notice, the few people they did have go, all stood outside the cyclone fence as that is free – but so far from the action and only 100 people maybe. Clayton’s you can see all the pop up tents, coolers, etc as it is BYOB and FREE to everyone. We can document the authenticity of this shot. Remember – this is on a SATURDAY of the BIGGEST day of the year for South Padre Island, not a Tuesday or something when it is more quiet. CLAYTON’S SPRING BREAK BEACH STAGE the exact same day, March 18, 2018 – before NOON! By the end of the day, it looks like the other crowded pics on our site. Again, NOT PHOTOSHOPPED. This is a DRONE shot. We are imitated but never replicated. We weren’t even going to post this, but there are some TERRIBLE photoshop pics that are being use in advertising by the “other guys”. The reason our parties at Clayton’s has more people is simple…our BEACH PARTY IS 100% FREE! It is BYOB…even kegs and coolers! Our DJS perform TOWARDS the beach…plus we have well known PERFORMING ACTS, too. Our VIP wristband allows you to get INSIDE of CLAYTON’s BEACH BAR for exclusive drink specials and VIP sections. Clayton’s has PLENTY OF FREE PARKING TOO. You must use a beach access to the north of Clayton’s for cooler entry you can’t drag em’ through the bar. Once you run out, no problem! $1 beers. Get hungry? No problem! $5 FULL lunch specials! 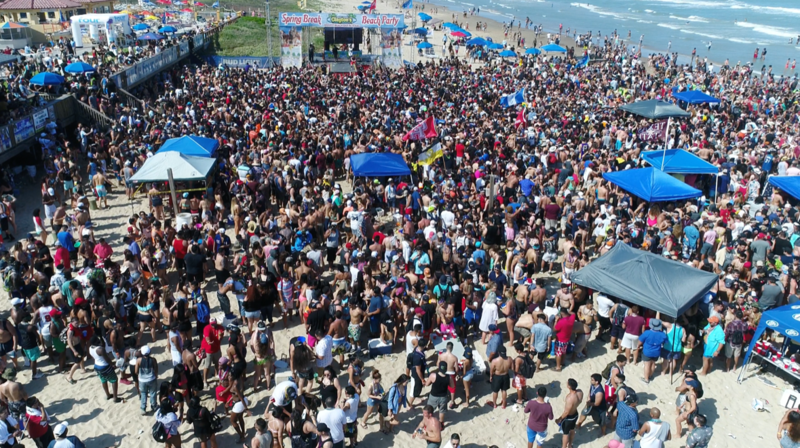 If you come to South Padre when it’s not TEXAS week, most of the students on the island have our VIP wristbands…so our parties are the biggest on the island! Out of the 3 weeks last year spring break beach stages ran, 50% of the time we completely CLOSED the “other guys” stage DOWN and there were ZERO people there. Not some. ZERO.